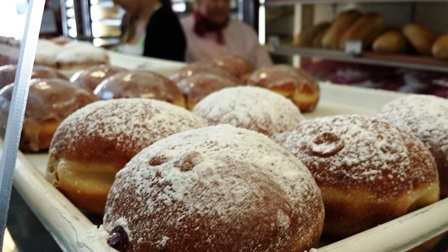 Custard and jelly filled doughnuts called paczki will line store and bakery shelves in Chicago for the next few weeks. The city celebrates paczki day on two days including Fat Tuesday and the Thursday before. This occasion marks a time of feasting before the Lenten fast — specifically on the jelly doughnuts known as paczki that are a tradition in Poland. But unlike cultures that celebrate Fat Tuesday, aka Mardi Gras, paczki have their heyday on two distinct days in Chicago’s Polish community. “By being of Polish extraction and living in Chicago, you get the best of both worlds,” explained Jan Lorys, managing director of the Polish Museum of America, which is located in the West Town neighborhood on Milwaukee Ave., the longtime “Main Street” of Polish Chicago. That happens on the Thursday before Ash Wednesday -- both in Poland and in Chicago’s bakery-filled Polish-American neighborhoods. So now that you understand the double-doughnut-day directive, we should say a word about the spelling and pronunciation of this deep-fried treat. You may also be wondering if paczki are really that much different from other jelly doughnuts, Bismarcks, Berliners, bombolini, Boston cremes, or sufganiyot. From the looks of them you might think they’re all the same. But Dobra Bielinski of Delightful Pastries explains that they are a denser, eggier affair. On Wednesday morning, Bielinski presided over a bustling kitchen that would crank out more than 20,000 paczki over the next week, including 10,000 pre-ordered doughnuts and several thousand for the City of Chicago’s birthday celebration in Daley Plaza Tuesday. “And those are just the orders we know about. We still have to make them for orders [by] people who are coming into the store,” Bielinski said. Giant bowls of butter, flour, rum, eggs, yeast, and sugar were spinning under the mixer. Workers rolled finished mounds of dough into lime-sized balls for proofing. Once risen, whole trays of paczki buns would be gently lowered into vats of oil. Traditionally, that oil would have been lard, but today Bielinski uses a blend of canola and soy to reflect changing customer demands . “If I had to do it at home, I would do it in lard,” she said. Midway through frying, the bobbing buns were expertly flipped using what look like two mahogany chopsticks. And when the hot walnut-colored pastries emerged from the fryer, they bore nary a drop of grease -- thanks, Bielinski said, to the rum in the dough that prevents excessive absorption of oil. Next up, is the sugar glaze, which was traditionally studded with candied orange peels, a delicacy in Poland during this time of year when fresh fruit was scarce. And lastly comes the injection of filling. Traditional fillings including prune and rose petal jam, but in recent years Bielinski has gotten more creative. Bielinski is especially proud of the tart and tropical passion fruit, which she makes from real fruit puree. If you ask a dozen paczki lovers about their favorite flavors, you could easily get a dozen different answers back. Responses we got included rose hip jelly, cherry, strawberry, apricot, prune, custard, chocolate, raspberry. But regardless of which flavor you choose, we can all agree that these round poofs of sweetness can offer some much needed comfort during this long punishing winter.